G7102XXUANA5 Android 4.3 Jelly Bean Firmware Last Updated on 12-Mar-2014. Samsung Galaxy Grand 2 Duos SM-G7102 received the latest XXUANA5 4.3 Jelly Bean official firmware update. Samsung recently started rolling out an OTA update about the firmware for several countries. The Galaxy Grand 2 Duos recently released by Samsung with Android 4.3 Jelly Bean out of the box and already get many firmware update. Here we have the latest G7102XXUANA5 4.3 firmware for the device. If you own the device and not yet updated this latest firmware, then update the same using our simple tutorial below. The below guide will help you to download and install the G7102XXUANA5 Android 4.3 Jelly Bean firmware manually through Odin. As the Galaxy Grand 2 Duos G7102 already running on the Android 4.3 Jelly Bean, you can only expect few bug fixes and performance enhancement with this latest Android 4.3 Jelly Bean firmware update. 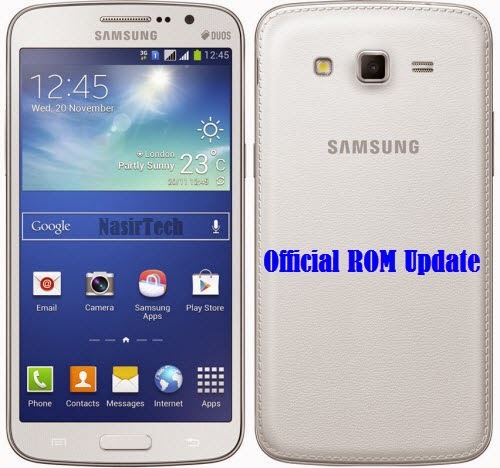 So, want to update your Galaxy Grand 2 Duos G7102 to the latest XXUANA5 Android 4.3 Jelly Bean firmware? To install in official way, either you can go for OTA update from Settings-About-Software Update or download firmware through the Samsung Kies utility. However, most of us prefer manual way to update official firmware. So, in this article you’ll find step by step manual guide to update the latest Android 4.3 XXUANA5 firmware on your Galaxy Grand 2 Duos G7102 through Odin. "The firmware is released only for the Samsung Galaxy Grand 2 Duos SM-G7102 model, so don’t try this in any other android device. Check your device model number from Settings-About Phone. Also the tutorial is based on Windows PC. Follow all the pre-requisites, procedures and steps carefully to avoid breaking your phone". Samsung rolled out the firmware for the following countries. The firmware which are unbranded or not locked to any carrier, no matter of which country or region, can be flashed on any Galaxy Grand 2 Duos SM-G7102 model. All the above pre-requisites are very important and must follow before proceed to installation guide. Hope you get all the above points. Now, go through the below tutorial to install Android 4.3 G7102XXUANA5 official firmware on Galaxy Grand 2 Duos G7102. Switch off your phone and boot Galaxy Grand 2 Duos G7102 into Download Mode by pressing and holding the Volume Down+Home+Power buttons (long press until the boot screen appear), now press Volume Up key to proceed to Download Mode. Congrats! you have completed the tutorial to update Android 4.3 Jelly Bean official firmware on Galaxy Grand 2 Duos SM-G7102. Hope you successfully done the update process. If you followed everything as mentioned in the above tutorial, then your Galaxy Grand 2 Duos should now running on the latest Android 4.3 Jelly Bean build version XXUANA5. You can confirm the firmware update details from Settings-About Phone. If you stuck in any point or find any issue with the download link, then feel free to contact with us using the comment form below. so 4.3 jelly bean not available for i19082.??? Pls add KitKat 4.4.2 update for galaxy grand 2 duos. Thank u very much @Md.Nasir. After successfully flashed, OS cannot get any Software Updates. It shows "Your device has been modified. No software updates available." Pls fix the issue as early as u can. I want Official Updates all the time. What you have done after flashing the firmware??? Just go to the Software Update option and try to update. Then the said notification coming. Sir, pls help me. Really, I can't understand anything! Can I flash my os again? Actually, I've rooted my device. Now I've Super Su and Busybox. I've totally missed it out to say u. However, can I flash my device again? And after flahhing, can I back again the previous Root facility? I've Triangle Away. But it has a risk of breaking the device! Under this situation, how can I get back my official update? From Android version 4.3 Samsung introduced Knox security, If you root your device after updating to 4.3, then you will loss official support and further official update. You can try flashing the firmware once again but I don't think so it'll work. If not work, then you have to wait for a solution until any developer comes with unlocked bootloader. Thank u so much for ur informations. Can I use 'Triangle Away'? I've heard that so many devices got back it's official support as well as official update facility through that app. I don't know indeed if it will work on my grand 2 duos Or not. Beside this, Triangle Away has also shown a caution that it may Brick the device! Pls suggest what can I do? I've successfully rooted my g7102 grand duos with prerooted firmware. But after update, I've faced 3 issues. No.1. Wi-fi isuue. It is unconfigured and it shows "Add Wi-fi Network". How can I configure it manually? No.2. Software update doesn't happen. It shows "Your device has been modified........". How can I get my official update now? No.3. The most important issue is that now my device has lost it's Recovery Mode menu. After pressing Power butten up+Menu button+Volume up button at the same time, the device gets stuck and shows "Downloadinding... Do not turn off terget" screen. And even when I go Reset my device from setting menu, similar matter happen. Now how can I get back my Recover mode menu? m waiting for 4.4.2 kitkat update ! may i knw d dates when it will be out ??? grand i9082 cannot upgrade to 4.3?? Hii Nasir I was trying to root my grand 2 g7102 through odin, setup goes fine but when i checked by root status using (root checker app) i was showing not rooted, but when i was trying to update my g7102 phone from jelly been to kitkat it was showing (your device has been modified software updates are not available) please help ?